We help you to sell your products through the online sales channels of Promidata. We import your product information in Promidata Portal and then we push your products to Promotional Office, Promotional Webshop and Promotional Finder. This allows your distributors to sell your products better and more efficiently. Especially in the Netherlands and in Germany there are many distributors who work on a daily basis with the software and the product information services of Promidata. If you as supplier are looking for possibilities to achieve more sales in the Netherlands and Germany, then, Promidata is the right partner for you. Efficient sale of promotional products starts with the creation and the publication of rich product information. Only then can the distributor and their customers decide more quickly to actually order your products. Today’s online customers demand extensive product information. These customers want to instantly see what the total costs are, including the variable and fixed editing costs for the printed matter per product before they decide to purchase your products. The Promidata sales network is a platform where supply and demand of promotional products come together at different levels. From supply and demand between the business end user and the distributor up to supply and demand between the distributor and you as supplier. 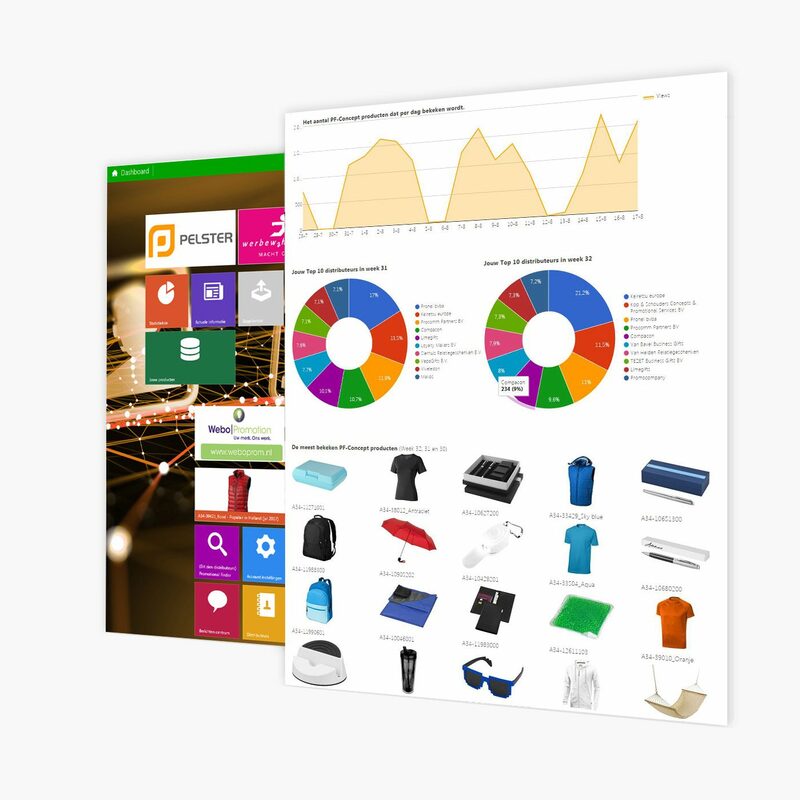 Promidata is a 100% independent provider of online software applications and data services with the aim of supporting the sales activities of all companies active within the promotional products industry. At the beginning of 2015 we started to develop a professional Magento webshop version for distributors who are active in the promotional products industry. As more and more distributors are signing up for our web stores, it is important that you, just like all other suppliers, are guided to the level of ‘Golden Supplier’ as quickly as possible. Over the last two years we have hired three additional employees and invested a lot of time to help suppliers individually in enriching product information. You can become a Golden Supplier if you can also provide information on the product’s print editing options in addition to the product information. We do not ask you this because we want it, but because the market is asking for it! 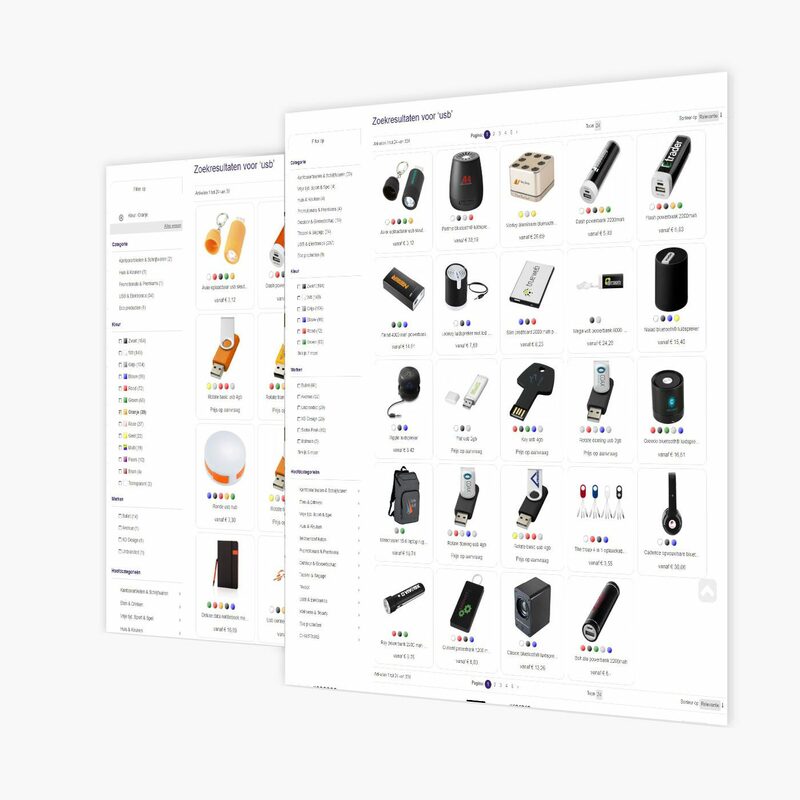 In addition to users of our webshop, we have a lot of distributors who use the same rich product data daily within Promotional Office (ERP Order Business Software). Promotional Office is nowadays the ERP standard within the promotional products industry. Below you can see some Dutch and German companies that make use of Promotional Office every single day. Would you like to apply for Promidata Portal for Suppliers? Thanks to the software from Promidata, our efficiency and quality of selling till to the extradition has been increased. Thanks to Promotional Office, we can respond much more flexibly to the customer’s needs. Because of this is our order handling and therefore also the delivery time of our products considerably decreased. The software of Promidata has useful and powerfull features which gives us the space to pay more attention to other important things. There are also distributors owning their own webshop solutions. We help those companies by providing them with a XML data feed. Via this XML data feed they can import your product information into their own webshops in an easy way. Click here to see this product in a live webshop. 4) The product assortment must be accurate and must be deliverable when a distributor receives an order via a webshop. ERP Software + eCommece solutions for managing logistical, administrative and sales processes for small and medium-sized suppliers active in the promotional products industry. Saying no to small orders? With our Web2Machine software, your smaller orders will yield higher margins for you. And your customers even produce their own artwork material. We have invested heavily in our data processing systems. The nice thing is that we can fully adapt ourselves to the delivery of the product information from each individual supplier. We have the ability to process the product information in any structure (XML, CSV, Web Services). Suppliers do not have to adapt themselves to Promidata, Promidata adapt itsselves to the supplier. 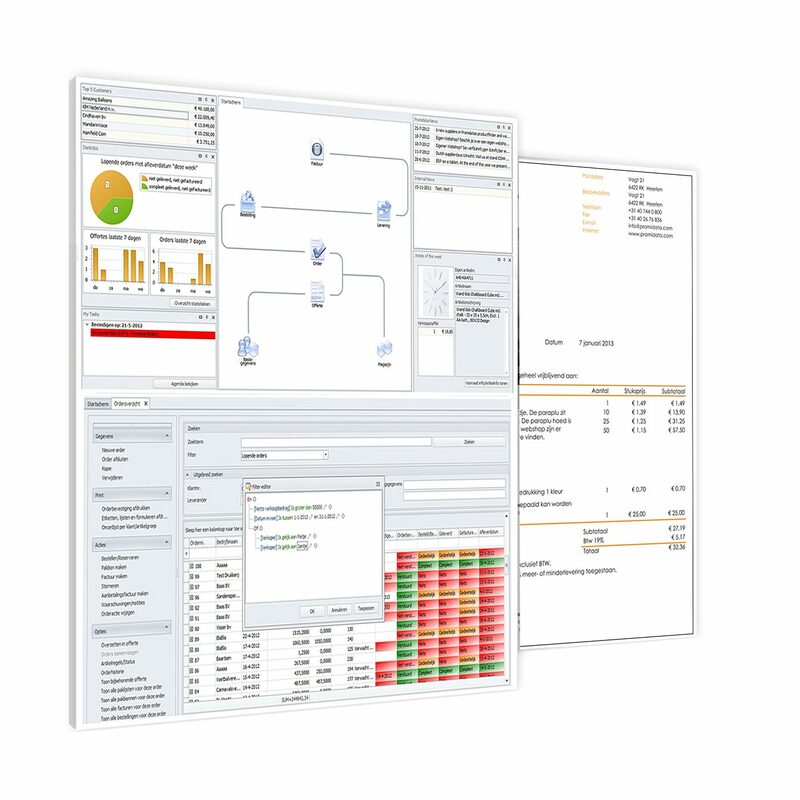 To make it even easier for suppliers, we have developed a Data Control Tool. The Promidata inventory system is capable to be attached to each supplier. Suppliers must, of course, be able to publish real-time inventory information online. So that Promidata can import this stockinformation periodically. Here too it does not matter how you as a supplier have arranged the online publication of this data internally; We can handle any data format. The beauty about this centrally managed inventory system is that all individual data users (i.e. distributors and end users) within the network of Promidata can use these stock data, whether it takes place through Promotional Office, Promotional Webshop or via Promotional Finder . Accurate inventory information per product is important because distributors and their end-customers can even easier decide to place an order with you. See all distributors affiliated with Promidata Portal? When you click on one of the following logos you will see how suppliers present their rich product information via our Dutch and German webshops. Each supplier can now upgrade to the status of Golden supplier free of charge within Promidata Portal. This will not happen automatically and you will also have to pay due attention to your side. They sometimes say ‘stagnation is decline’, and that is especially true in this time for the quality of the product information. We find this so important that we do everything possible to assist each supplier during the enrichment of their product information. 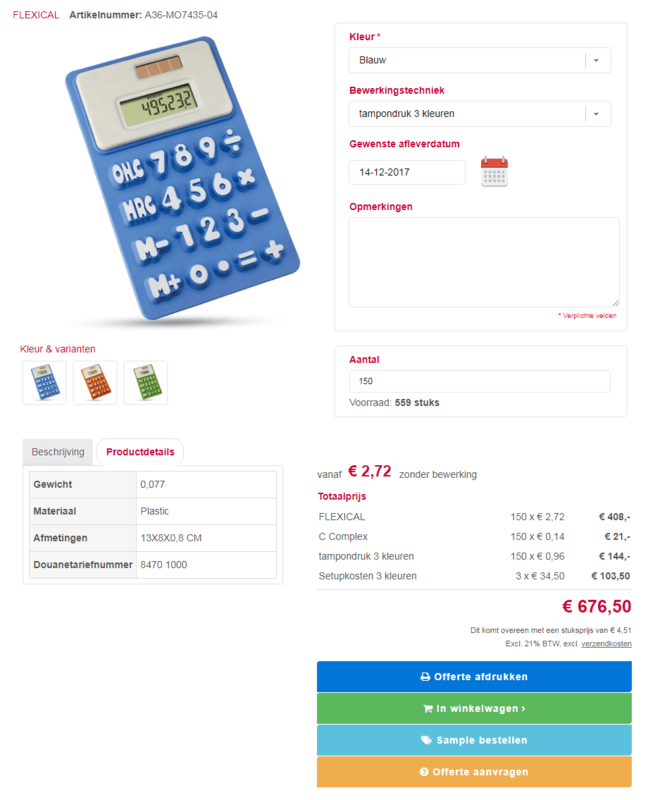 Promotional Finder has now become the standard for the Dutch and German distributor when it comes to product sourcing. More than 95% of all affiliated distributors log in several times per day to simply search for products and to obtain product ideas for their customers. Recently we have completely rewritten the statistics within Promidata Portal. First we measured the click throughs from the distributors’ websites, but what we forgot to show was the huge amount of views that were generated daily within Promotional Finder. We have now made that transparent and you as a supplier can now see this within your own login. Do you want to be found better by your distributors and their end customers? 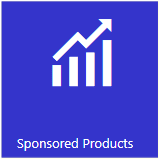 Did you know that you can easily promote a number of your products by making them appear at the top of search results on the Promidata Network? Very handy if you are convinced that a particular product needs to get more attention. For a relatively low price, you can use Sponsored Products to set up a so-called ´keywords campaign´. How does it work? First, you start by finding the best keyword. A keyword with which your product is best found. The popularity of that keyword determines the price you have to pay for it. A campaign always runs for a whole work week. You do not pay per click, your campaign price is fixed and known before you start your campaign. You can reserve campaigns for several keywords in future weeks so that you can already plan your strategy in advance. Your product (s) will not only be at the top of all distributors websites , but of course also at the top of Promotional Finder (the sourcing tool for distributors), in Promotional Office (the ERP system for distributors) and in all Promidata Magento webshops. You can also find them on this website under the menu item ‘Sponsored‘. 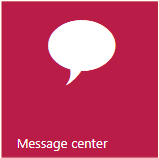 Did you know that you can easily send important messages to all your distributors via the free Message center? You can make messages about various subjects, such as a product scoop, a new employee, a new service, a promotional campaign, etc. All logged-in distributors will see your message and you can then follow exactly how often your message has been read. Your messages will also appear in Promotional Office so that these users will also read your messages. On this website you can find them under menu-item ‘Messages‘. Distributors use your messages as an inspiration source to create their own messages for their own end customers. They can do this via email, but also via Twitter and directly to their Facebook pages so that your message will get an even greater range. Did you know that we distribute banner artwork among the distributors? Distributors can download these banners for free to use in their own webshops. We have hundreds of distributors who are happily using this service. You too can create banners for these distributors. Since we have different types of web shops you always have to deliver a banner in 3 different variations to us. Namely in the dimensions 940 by 300 pixels, 1583 by 300 pixels and 2114 by 300 pixels. If you want to participate, send an email with the above 3 variations in one email to roy@promidata.com. Just click on the “Artwork” icon on the left. You then see exactly how we offer this to the distributors. You can also see some examples of these 3 types of webshops that we have developed. Request Promidata Portal for suppliers? Is your product information not yet in Promidata Portal? Please fill in the following form and we will help you to arrange that. Immediately after clicking OK you will receive an email from us. You need to confirm this email.